( Dessert & Méchin 1890) For over a hundred years this fine purple red peony has been very popular, very widely grown and very well regarded as a great cut flower and garden specimen; the color is deep and lustrous, more so than in the photo here; some yellow stamens may show between the petals; strong stems with foliage tinged red in fall; a feast for the eyes, but perhaps not for the nose. 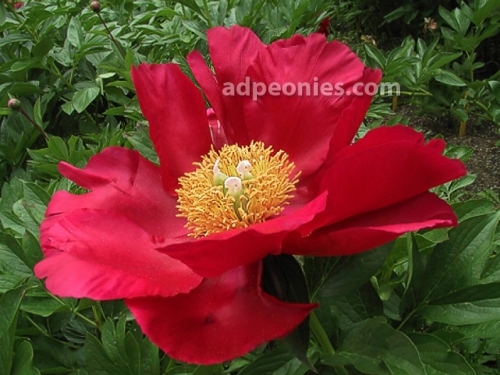 Probably no other red peony matches the warm, glowing cardinal red of this treasure; maintains its intense color throughout the bloom; cup-shaped semi-double will be a robust bloomer in your garden; 24 inches or more; outstanding in every respect, rarely available. (Rudolph/Roy Klehm 1976) Magnificent glowing red single is big, showy and slightly ruffled, with golden centers and a mild fragrance; a mature plant is loaded with blossoms that stand high above the foliage; excellent stature, needs no support. (Orville W. Fay 1973) Large, fiery scarlet red with two rows of rounded petals and a center of bright sunny yellow stamens; plant height to 30 inches; vigorous grower. (Glasscock 1951) Bright red single, an APS Gold Medal winner decades ago, is still considered one of the best reds; large tuft of red stamens edged in gold; an abundance of blooms for a long period of time; medium height, strong stems need no staking; fragrance mild to none. 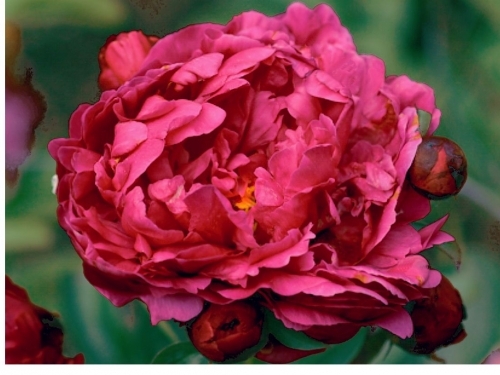 (Krekler 1962) Deep pink double with a bit of silver edging on the tips of petals, an effect that makes the peony really stand out in the garden; some golden stamens show through the petals. (Auten 1952) A cheerful deep red single that shows off a multitude of pretty blooms about 3 inches in diameter; forms a mound of deep green fine cut foliage that makes an attractive plant even when the blooms are gone; a gem for the rock garden, no taller than 24 inches and one of the earliest hybrids to bloom; emerges with vivid purple stems that turn green as they grow. (Krekler 1975) Medium size double bomb flowers of deep scarlet red on a plant no more than 24 inches in height; a cheerful bright red for the front of a border or an entire border. (Doriat 1925) This hefty Japanese variety becomes a veritable thicket of foliage with tall and thick stems that bear very large velvety deep carmine maroon blossoms; the petaloids are tipped white which creates a distinct effect; profuse bloomer; some fall coloring to the foliage. (Hollingsworth 1986) A prolific bloomer with many medium-size flowers whose buds hold for weeks in refrigerated storage; a brilliant shade of red that is rich and warm; many stems form a medium size bush; provides a good show in the landscape, too. (R. G. Klehm 1999) A cactus type Japanese flower, an unusual form gaining popularity; the 5-inch blooms open flat with fluted and undulating petals; white with bright and showy raspberry red streaking; stunning in bouquets. (Krekler-Klehm 2000) Vivid carmine red Imperial flecked throughout with creamy white and carmine petaloids; large impressive flowers, two or three buds per stem; plant height to 26 inches. 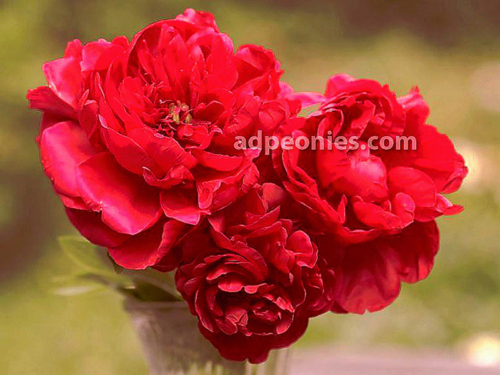 (Holland) Lustrous black red double sometimes flecked with golden stamens; very large rose form flowers; noted as an improved M. Martin Cahuzac, which had been known as the darkest peony; in the morning the petals seem to have a black sheen over the deep maroon; handsome foliage turns red in the fall; stiff stems; superb cut flower. (Krekler 1958) Dark burgundy red guard petals surround a mass of same color staminodes that are tipped with yellow gold; compact grower to about 34 inches; staking usually not necessary.